Borghild Telnes (b. 1961) is a Norwegian calligrapher who set up her own workshop ten years ago and now works double tides. She studied art history at the University of Oslo; attended Einar Granum’s School of Drawing and Painting in Oslo, and took an extensive correspondence course in calligraphy at the Roehampton Institute in London. She also attended a series of workshops and courses with such world-famous calligraphers as: Jean Lacher, Ewan Clayton, Christopher Haanes, Margaret Daubney, Denis Brown, Thomas Ingmire and Ann Heckle. 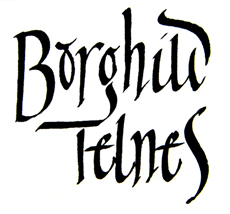 She often combines calligraphy with various printing techniques, illustration and ornamentation, covering a range of different calligraphic styles. During the last few years she paid special attention to the works of two Norwegian poets, Olav H. Hauge and Hans Børli, and participated at several exhibitions across the country. She is a member of the SKRIFT and the Kalligrafisk Klubb Norwegian calligraphic associations, and of the Calligraphy and Lettering Art Society (CLAS, UK).